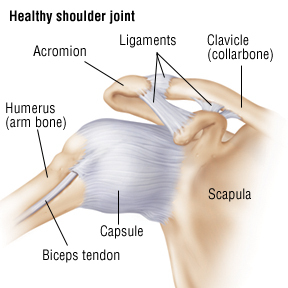 A sprain that tears ligaments in the shoulder most often occurs at the joint between the acromion and collarbone, called the acromioclavicular joint. This injury sometimes is called a shoulder separation. Less often, a shoulder sprain involves the joint between the breastbone and collarbone, called the sternoclavicular joint. This joint is within an inch of the midline of the chest. Many people would not guess that it's part of the shoulder.